For the ancient city of Alexander the Great in the Thracian mainland, see Alexandropolis Maedica. 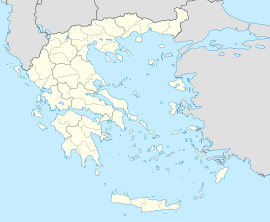 Alexandroupoli (Greek: Αλεξανδρούπολη, pronounced [aleksanˈðrupoli]) or Alexandroupolis is a city in Greece and the capital of the Evros regional unit in East Macedonia and Thrace. It is an important port and commercial center of northeastern Greece. Alexandroupoli is one of the newest cities in Greece, as it was only a fishing village until the late 19th century. However, the modern city is located at the site of ancient Sale (Greek: Σάλη), a Greek city of the classical era founded by colonists from the island of Samothrace, mentioned by Herodotus. Alexandroupoli benefits from its position at the centre of land and sea routes connecting Greece with Turkey. Landmarks in Alexandroupoli include the city's lighthouse in the port, the archaeological sites of the Mesimvria Zone and Maroneia stretching out to the small port of Agios Charalambos, the city's waterfront (the centre of commercial activity), and the nearby Evros Delta. The municipality has an area of 1,216.954 km2, the municipal unit 642.245 km2. The province of Alexandroupoli (Greek: Επαρχία Αλεξανδρούπολης) was one of the provinces of the Evros Prefecture. Its territory corresponded with that of the current municipality Alexandroupoli, except the villages Peplos and Trifylli. It was abolished in 2006. The modern city of Alexandroupoli was founded as a small fishing village in the early 19th century (when what is now northeastern mainland Greece was still under the rule of the Ottoman Empire) by fishermen from the villages of Makri and Maroneia and it became known as Dedeağaç (Greek: Δεδεαγάτς, Turkish: Dedeağaç [dedeaːtʃ] Bulgarian: Дедеагач [dedeagatʃ]). According to the legend, the name was based on a wise old Turkish man or dede who spent much of his time in the shade of a local tree (in Turkish ağaç) and was eventually buried beside it. In 1920, King Alexander I of Greece visited the city, and the local authorities decided to rename the city Alexandroupoli ("city of Alexander") in his honor, a request which was approved by central Greek government. Alexandroupoli is about 14.5 km (9.0 mi) west of the delta of the river Evros, 40 km from the border with Turkey, 346 km (215 mi) from Thessaloniki on the newly constructed Egnatia highway, and 750 km (470 mi) from Athens. Around the city one finds small fishing villages like Makri and Dikella to the west, and suburban Maistros, Apalos, Antheia, Aristino, Nipsa, Loutra to the east, while north of the city are the ever closing Palagia, Avantas, Aissymi and Kirkas. At the 2001 census, the main city had a population of 48,885 and the municipal unit had a population of 52,720. The current metropolitan population is estimated at around 70,000 inhabitants, and its area covers the southern portion of the regional unit, running from the Rhodope regional unit to the Evros Delta. Besides Alexandroúpolis, its other largest settlements are the villages of Mákri (pop. 820), Ávas (497), Sykorráchi (309), Aisými (289), and Díkella (288). Ruins of the Byzantine Avandas castle outside the city. The settlement's history goes back to the 19th century, when the area was part of the Ottoman Empire. Long used as a landing ground for fishermen from the coast of Samothrace opposite, a hamlet developed in the area during the construction of a railway line connecting Constantinople to the major cities of Macedonia from Kuleliburgaz. The work was part of an effort to modernise the Empire, and was assigned to engineers from Austria-Hungary. The settlement soon grew into a fishing village known as Dedeağaç. In 1873 it was made the chief town of a Kaza, to which it gave its name, and a Kaymakam was appointed to it. In 1884 it was raised in administrative rank from a Kaza to a Sanjak, and the governor became a Mutasarrıf. In 1889 the Greek archbishopric of Aenus was transferred to Dedeağaç. In the late 19th and early 20th century, Dedeağaç was part of the Adrianople Vilayet of the Ottoman Empire. Dedeağaç was captured by the Russians during the Russo-Turkish War (1877–1878), and Russian forces settled in the village. The officers in charge saw that reconstruction incorporated wide streets running parallel to each other, allowing the quick advance of troops, and avoided cul-de-sacs. This was very unlike the narrow alleys, cobbled streets, and dead-ends that were characteristic of Ottoman cities at the time. The city returned to Ottoman control by the end of the war, but the brief Russian presence had a lasting effect on the design of Alexandroúpoli's streets. The building of a railway station in Dedeağaç led to the development of the village into a town, and a minor trade centre by the end of the century. The town became the seat of a Pasha as the capital of a sanjak. Ottoman control of the town would last until the Balkan Wars. On 8 November 1912, Dedeağaç and its station was captured by Bulgarian forces with the assistance of the Hellenic Navy. Bulgaria and Greece were allies during the First Balkan War, but opponents in the Second Balkan War. Dedeağaç was captured by Greek forces on 11 July 1913. The Treaty of Bucharest (10 August 1913) however, determined that Dedeağaç would be returned to Bulgaria along with the rest of Western Thrace. In September 1913 after the end of the Second Balkan War about 12 000 Bulgarian refugees took temporary asylum at the outskirts of the city. They were from 17 different villages all over the Western Thrace fleeing ethnic cleansing. The defeat of Bulgaria by the Allies in World War I (1914–1918) ensured another change of hands for the town. Western Thrace was withdrawn from Bulgaria under the terms of the 1919 Treaty of Neuilly. Alexandroupoli was under temporary management of the Entente led by French General Charpy. In the second half of April 1920 in San Remo conference of the prime ministers of the main allies of the Entente powers (except United States) Western Thrace was given to Greece. However, Bulgaria retained the right of transit to use the port of Dedeagach to transport goods through the Aegean Sea. The change of guard between French and Greek officials occurred on May 14, 1920 in the city's Post Office. In the interior of the Post Office there is a memorial plaque concerning this event. The city was soon visited by Alexander of Greece. He was the first King of Greece to visit the town which was renamed in his honour. Following the defeat of Greece in the Greco-Turkish War (1919–1922), the Greek Army under General Theodoros Pangalos retreated from Eastern Thrace to the area of Alexandroupoli. Bulgaria used the opportunity of the Greek defeat to demand that Alexandroupoli either be returned to its control or declared a neutral zone under international control. Both demands were soundly rejected by the Greek leadership and found no support in the League of Nations. The Treaty of Lausanne (24 July 1923) affirmed that Western Thrace and Alexandroupoli would continue to be controlled by Greece. During World War II (see Axis occupation of Greece), the Nazis gave Alexandroupoli to their Bulgarian partners Alexandroupoli was subsequently under Bulgarian occupation between May 1941 and 1944. The city suffered some damage to buildings and loss of population during the war, but was largely spared the effects of the Greek Civil War (1946–1949). Forces of the communist Democratic Army of Greece in and around the town area were small and loosely organized, resulting in the absence of major battles in the area; the return of peace allowed for Alexandroupoli to grow from a town of 16,332 residents in 1951 to a city of 57,812 residents by 2011. It has a sister city, Edirne (Andrianoupolis), since November 30, 2007. Some highly specialised medical operations are performed in the new Regional University Hospital – Research center, currently the largest one in the Balkans. The city has a network of public schools, from nurseries to high schools, under the responsibility of the city council (though the student are subjects under the responsibility of the Ministry of Education). There are also many private language schools, most of them offering European Languages courses. Languages spoken by the citizens include: Greek, English, Russian, Bulgarian, Armenian, German, and Turkish. The city has a reputation of consistently sending large number of students to attend national and international universities. The old military railway station (Gare Militaire) of Alexandroupoli. Alexandroupoli is served by Dimokritos International Airport (IATA:AXD) in the suburbs of Apalos, about 6 km from Alexandroupoli city centre. It is one of the busiest airports in Greece and a main hub for Olympic Airways and Aegean; there are 6 daily flights to Athens, and also flights to Crete, while during the summer months some seasonal flights operate to/from Germany and Russia. The airport is connected to the city by highway, taxi services and scheduled bus services. The port of Alexandroupolis has been used principally by travellers. There are daily services to the Island of Samothraki and a weekly Trans-Aegean service to all the eastern islands of the Aegean, with the final destination of the island of Rhodes. Alexandroupoli has two train stations: Alexandroupoli and Alexandroupoli Port. Both are served by trains to Thessaloniki and to Dikaia. There is an extensive network of train and bus replacements services throughout the region of Evros. There were railway connections to Burgas in Bulgaria and to Edirne and Istanbul in Turkey, but those were suspended. The bus network is much more extensive and frequent. Hourly buses to the major municipalities within Macedonia and Thrace offered from the Regional Coaches KTEL as well as daily services to Bulgaria and Turkey. OSE-Varan and Ulusoy have daily services to Istanbul and Athens each and depart from Alexandroupolis Railway Station in early mornings. In 2009, the stadium hosted an international rugby match between Greece and Bulgaria; the match was the first time that Greece had played a home match outside of Attica. The city's volleyball team, Ethnikos Alexandroupolis, regularly competes in the A1 Ethniki, the top division of the Greek volleyball championship and plays in the city's indoor sports stadium, Klisto Gimnastirio Alexandroupoli, next to the football stadium. ^ "ALEXANDROUPOLIS Climate Normals 1961–1990". National Oceanic and Atmospheric Administration. Retrieved January 29, 2013. One or more of the preceding sentences incorporates text from a publication now in the public domain: Chisholm, Hugh, ed. (1911). "Dédéagatch" . Encyclopædia Britannica. 7 (11th ed.). Cambridge University Press. pp. 917–918. ^ "Treaty of Neuilly, article 27 (3), 48". Lib.byu.edu. Retrieved 2014-03-05. ^ "New Rule in West Thrace, The New York Times, December 8, 1919" (PDF). New York Times. 1919-12-08. Retrieved 2014-03-05. ^ "Grafiki Palia Alexandroupoli". Oldalexandroupoli.gr. 1920-05-14. Retrieved 2014-03-05. ^ "ESPN Scrum.com". ESPN Scrum.com. Retrieved 2014-03-05. ^ "Scoresway.com". Scoresway.com. Retrieved 2014-03-05. Wikivoyage has a travel guide for Alexandroupolis. Ethnological Museum of Thrace (Angeliki Giannakidou).